The Smooth Jazz Duo do exactly what it says on the box; two outstanding musicians playing some of the smoothest jazz ever written. 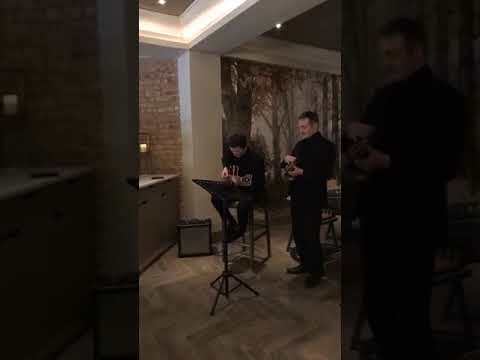 Seriously classy arrangements, gracefully performed by two of the absolute best in the business - just have a listen to their online demos to see what we mean. The Smooth Jazz duo are perfect for low key quality background music for all kinds of events, including champagne receptions, product launches or corporate dinners. Add a touch of elegance and please even the most discerning music lover at your next event - book the Smooth Jazz Duo if you can - Nice! Smooth Jazz Duo are perfect for creating the beautiful background music and exquisite ambience needed for an intimate wedding, to corporate event. Add to your shortlist and get an instant quote and date check now. Sorry, Smooth Jazz Duo doesn't have any photos right now Send us an enquiry and we'll get back to you, or check out the rest of the act profile. Smooth Jazz Duo played at our wedding recently and they were absolutely fantastic. They were background music to our drinks reception which took place outside. You could hear them throughout the walled garden and they were a touch of class. Many guests commented on how great they were. All on was happy for us to send them some requests and this added to our wonderful experience! Couldn't have asked for more. The guys were great and the music choice and quality was perfect. All of our guests absolutely loved the music being played as well. We also had a few comments from the staff at the hotel saying how good they were. Thank you Smooth Jazz Duo for an awesome night- you guys were great! Dear Hireaband, We would like to thank you very much for providing the Smooth Jazz Duo to play at our wedding ceremony and champagne reception, at Turnberry on 10th Sept. They were absolutely brilliant, and their music was perfect for both the ceremony and drinks reception after. Our guests loved their music, and they definitely added to the occasion. We can't thank you and the boys enough. Dear Hireaband - Thank you so much for organising the Smooth Jazz Duo to play at a surprise birthday party on Saturday in Overton Hall. They were brilliant, and provided just the right kind of musical atmosphere for our celebration. They were really helpful when I discussed the timings and playlist etc and they greeted James with the best rendering of 'Happy Birthday To You' he's ever had when he walked in. I would recommend them on every count. Thank you again. Overall, a wonderful day. The music added to a wonderful atmosphere and the wedding party all loved the entertainment. The wedding was excellent and everybody loved our music. So many people said it was a lovely touch of background music (not too quiet and not too loud) while they had a few drinks inside. What I heard of them was excellent. I hope our poor piper doesn't get a complex as our flower girl totally freaked out at him and wouldn't walk down the aisle at all!! And she likes the pipes too!!.. I think all the excitement was actually too much for her...And Graeme called out our Ceilidh dances which was perfect and he got so many people up especially for "strip the willow" which was near the end. It was a great day and I can't tell you enough how grateful I was for your help especially Lisa Cotton at the beginning when I just didn't know where to start. Thanks very very much! !